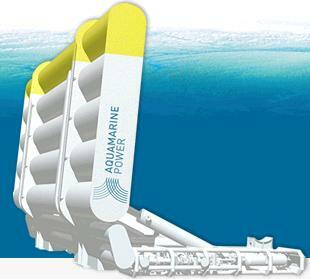 Since November 2009, a demonstration-scale Oyster wave energy converter from Aquamarine Power has been exporting electricity to the National Grid from its site at the European Marine Energy Centre (EMEC) in the sea off Orkney. Aquamarine Power have partnered with major utility company Scottish and Southern Power to co-develop up to 1,000MW of Oyster sites based around the next generation Oyster 2 commercial scale wave power device. A 2MW demonstration site will be built by 2011, and will be expanded to 10MW installed capacity by 2012. 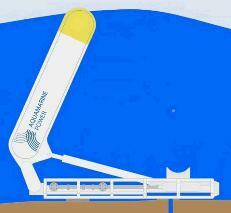 With half of the device attached to the seabed, the buoyant part is pushed backwards and forwards by the waves. 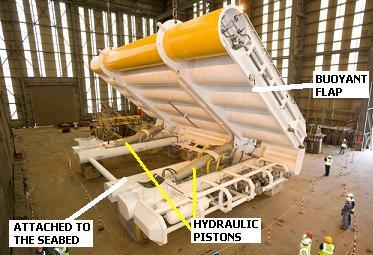 This drives the pair of hydraulic pistons which pump water at high pressure onshore. This water then drives a conventional hydro-electric power plant to generate electricity which can be exported to the National Grid. 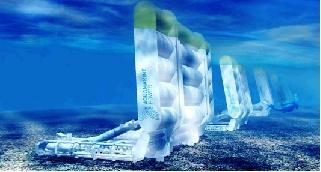 The commercial scale Oyster 2 being built this year (2010) will have an installed capacity of 2.5MW. It will comprise three of the next generation Oyster hinged flap wave power collectors and one onshore hydroelectric generator. Commercial 100MW farms of Oyster wave power devices are planned so that the shared water pipeline and generator fully exploit efficiencies of scale. The Oyster is itself a relatively simple, modular, and robust device which is suitable for low cost mass production. The complex (and more expensive) electricity generating components are all located on land for ease of maintenance and increased longevity. Multiple Oysters can be put close to each other at a site to create a wave farm with them all feeding the same single onshore generator with high pressure water.